SPRING is a great time to replace your old ugly front door! Woodland is having an Ugly Door Contest to help you get motivated. The contest winner will receive a Therma-Tru Fiber Classic Mahogany Door retail value of $3,200*. See terms and conditions and more information at the contest page. To enter, submit a photo of your door with a brief description. The deadline to submit a photo is Monday, April 15. From Tuesday, April 16-19 (noon), readers will vote for the ugliest door. Replacing a home’s old windows, especially in historical neighborhoods, with bad replacements has a lasting effect on the curb appeal of your home and the neighborhood. Windows define a house as the most prominent feature that can add or detract from your home’s style. It was no surprise then when the new owner of a classic 1899 mission style home in a Chicago suburb, a professional architect, readily spotted the offending replacements as upsetting the rhythm of the house and set about to restore the home’s original façade. Walk into a beautiful space, a classic museum, an elegant hotel, a swank lobby or a beautiful home and we’re struck by how we feel. Design should express and reinforce the essential idea of the space. The room’s angles, ceiling heights, architectural details, focal points or the outside landscape. Wood Windows - White or Natural? If you’re a fan of HGTV you most likely think that white is the only color for your home’s interior windows and trim. Then again, if you’re a fan of This Old House and love traditional and historic homes, you most likely think that natural wood is the more beautiful choice. Is one choice better than the other? It depends on the look you want to achieve and your existing window and trim color. Thinking about remodeling your home and replacing your old windows? Come to our Open House this Saturday, September 30th and pick up a copy of the remodeling guide with tips about replacing your windows. A consistent theme among customers looking at windows and doors for their remodeling projects is to profess that they want a modern look. After talking and showing them various products, we begin to understand what ‘a modern look’ actually means to most people. What they’re usually describing is the desire for an up to date, fresh look that is fashionable. Although it’s very important when remodeling to stay true to the style of the home, there is a lot of latitude to replace windows and doors with products that will modernize your home. One of the greatest window innovations is the addition of Low-E Glass and gas filled insulated glass units (IGUs). That improvement happened back in 1981 roughly 35 years ago. So, it’s hard to imagine all these years later that there are still so many older homes with single pane windows that can’t take advantage of this technology. The best entry door is the one that best suits your home style. It’s a key element of design so when you’re ready to replace your old door, consider upgrading to a door with architectural style. One style that’s versatile and back in vogue is the Dutch door. Replacing strategically selected windows during your remodel can significantly enhance your entire project. Have you ever been invited to see your neighbor’s or a friend’s newly remodeled kitchen and what you see are updated appliances, cabinets, countertops, floors and freshly painted walls? What you’re seeing is very typical and would be more accurately called a kitchen replacement, not a remodel. The same thing happens with window replacement. A home’s windows are old, inefficient, inoperable, or badly worn and the homeowner replaces them with a new replica of the old windows. Like the new kitchen, the new windows look and function better, but the space hasn’t improved. A better way to get the most out of replacing your windows is to focus on enhancing – improving the quality of your environment by intensifying and amplifying the effect of your windows. If you're remodeling, replacing windows can significantly enhance your overall project. The building industry has transformed over the past decade because of new technologies and designs that make our homes more comfortable and more economical. Traditional homes valued for their quality craftsmanship or architectural significance can now undergo renovations to bring them up to modern building standards without compromising the beauty of the original home. Today’s major trend in home building and remodeling are home designs that connect the outdoors with the indoor. These new wide-span doors from Marvin, Andersen, and others, create expansive openings, while engineered to slide easily and make a perfect seamless connection between the indoors and outdoors. A traditional slider can be up to 10 foot wide, while these doors can be up to 16 feet wide. The design significantly opens the view and allows for natural ventilation into your home. These beautifully designed and engineered doors can take a big bite out of your budget. Before you rule out creating oversized openings between your home and the outside, consider other alternatives that will give you essentially the same result for a smaller investment. Creating oversized door openings and expansive window walls can be achieved on a budget by using standard sized windows and doors put together in a modular way to achieve the look you want. Depending on the overall size you need, your options for creating the look you want are limitless. Oversized Doors Connect the Indoors to the Outdoors. 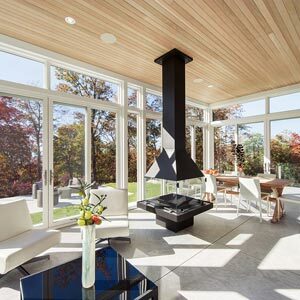 One of the hottest building and remodeling trends is seamlessly connecting the indoors to the outdoors. Reinventing the sliding patio door, better known as ‘the slider’, can do this. So, before you replace your clunky old sliding patio door, the one that gives you a workout every day, with a new sliding patio door, read this first to learn about fresh selections for replacing your old doors. 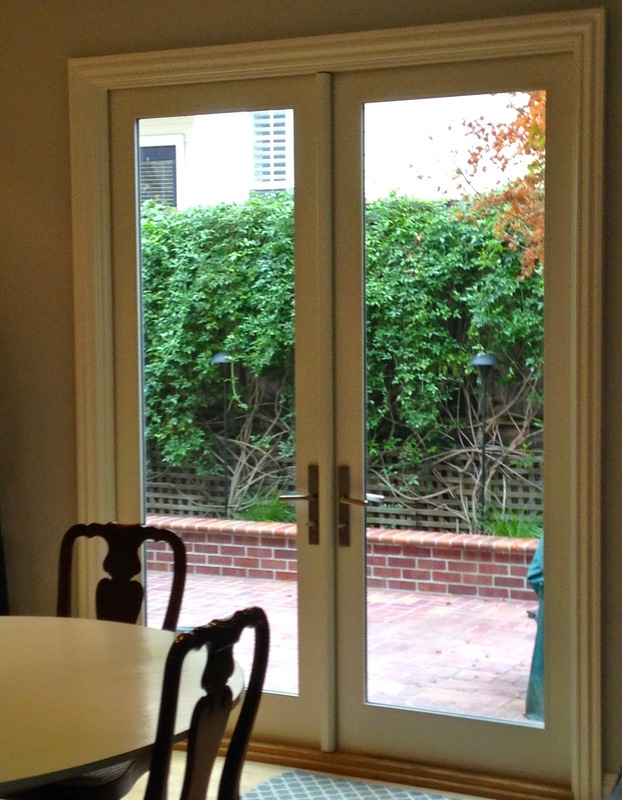 Patio doors are an architectural design element. At Woodland we see a lot of patio doors that were installed 30 years ago. Homeowners tell us they think the doors look dated and have been hard to operate for years. Door technology has come a long way since those sliders were put in. Today, the right patio doors can be an architectural design element of your home. One patio door that is getting a lot of attention today is the lift and slide door, which creates expansive openings while remaining easy to slide. Turning the handle allows the unit to move, by lifting the door and removing the pressure on the track for easy operation. Unlike a traditional multi-track sliding door, once the panels are in their new location, you turn the handle again and the doors lock creating an incredibly tight seal. These doors come with a flush or recessed sill option, which makes a seamless transition from the indoors to the outdoors. In Illinois, where snowy winters and stormy wet weather can easily cause water problems, Woodland recommends these doors for use with covered patios, enclosed porches, or sun rooms. In this climate, it is better to install raised thresholds and the higher the threshold, the less likely water will penetrate. Create an equally beautiful look using modern multi-panel oversized sliding glass doors or French Doors. Modern sliding glass doors, often called a French slider, expand the traditional two-panel configuration to four panels. The two outer panels are fixed in place; the two inner panels operate. A traditional slider can be up to 10 foot wide, while these doors can be up to 16 feet wide. The design significantly opens the view and allows for natural ventilation. French doors are an elegant architectural element that connects the inside to the outside of your home. Although these hinged doors require less wall space than sliding doors, if they are in-swing doors you’ll need to plan your furniture arrangement accordingly. Also note that these doors are typically no wider than about six feet, although you can pair the doors with sidelights to increase the view. The out-swing French door is an option, but again, for our climate, Woodland recommends out-swing doors only if they open into an enclosed space like a porch or sunroom. Imagine trying to open your door with snow piled on the outside. 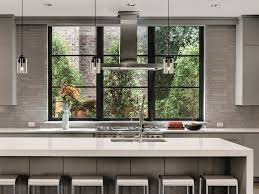 For all of these new modern patio doors we recommend the best locking systems available, mortise locks, foot bolts or a multi-point locking system for security and for an airtight connection. Modern expansive doors don’t have to break the budget and add immeasurable value. Woodland carries a broad selection of state of the art patio doors from the best manufacturers, so you’ll have the selection that meets your design goals and budget. A few choices include, Marvin Ultimate Lift & Slide. If you want expansive views, this door can open up to 48 feet wide and when opened it can stacked or disappear completely into a wall. Marvin also offers the Ultimate Sliding French Door or a traditional swinging French door. A popular feature is the new fully integrated shades. Marvin shades match current Marvin interior door finishes giving a seamless look. The Andersen 400 Series Frenchwood Gliding Patio Door or swinging French Doors are also popular choices today. There are far too many choices to cover everything here, so when you’re ready, come to our showroom and have a look. Plan a head and don’t settle for replacing your old clunky slider with a new clunky slider. Instead, you can create an architectural element that opens your home to the outdoors. There are a couple of things you need to think of when giving your home a facelift: Should you remodel your bedroom first, or the rest room? Should you remodel your entire home, or add some few rooms? How do you answer such questions? But did the thought of lead in your remodeling project ever cross your mind? If yes, you might want to learn the Environmental Protection Agency (EPA) guidelines first.